Power through its bottom edge connector. Enable to power by USB connector. When we use USB connector to charge, what we need to pay attention is if we want to obtain a bigger current(like drive servo or motor), we'd better not to power by USB but to use portable power supply. Because some boards have current protection function, while the USB connectot can only output 500mA. Can power through DC power, available for 5V to 12V. If you have DC power supply of Arduino, you don't have to buy other DC power supply. The output voltage is stable around 3.2V, which can make sure the accuracy of the sensor. 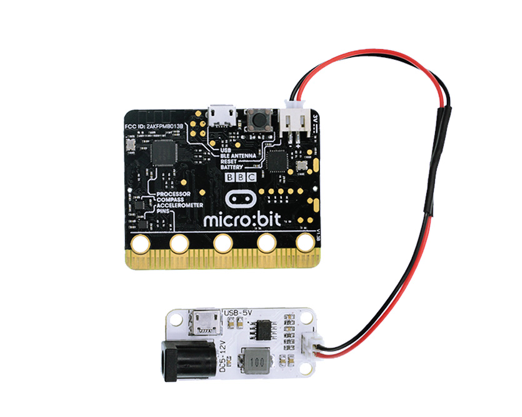 The output can connect micro:bit JST battery connector directly. It has good compatibility. Want to know how much powerful the micro:bit power supply module is? You can watch the video below. In the video, micro:bit power supply module powered by DC terminal has driven: three channels of servos, 1 ESP8266wifi module, 1 PM2.5 module, 1 dust sensor, 2 noise sensors, 1 buzzer, 1 OLED screen, which arrives 10 components in total, at the same time.